The new iPhone 4S features a redesigned antenna design that allows for better reception and faster wireless data speeds, a tweak that should further distance Apple from the "antennagate" controversy that occurred around the launch of the iPhone 4. Leading up to Friday's launch of the iPhone 4S, AppleInsider will offer a closer look at some of the features of the next-generation handset. Given that the 'S' in the device's moniker was never officially defined by Apple, we offer five potential definitions. Today: 'S' is for Signal, with a newly redesigned antenna. Soon after the release of the iPhone 4 in 2010, it was discovered that covering the bottom left of the phone, where two separate antennas meet, could reduce cellular reception with the device. In low-signal situations, this could result in a dropped call. The ensuing media firestorm prompted Apple to uncharacteristically hold a special press conference last July, where the company announced it would give away free cases to iPhone 4 customers for a limited time. 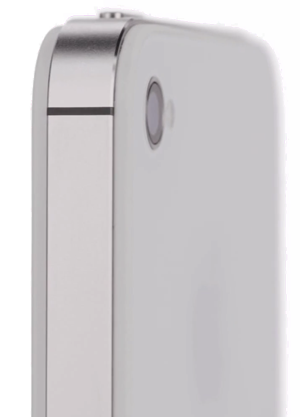 The controversy stemmed from the fact that the iPhone 4 has a unique design where the metal edges of the device also serve as its antenna. Any reception issues could be resolved by adding a case to the phone, which prevented users' skin from touching the antenna and causing signal attenuation. Apple also noted that competing smartphones experience similar issues with reception, and shared videos on its website showing decreased reception when holding a BlackBerry Bold 9700, HTC Droid Eris, Samsung Omnia II, and even the iPhone 3GS. For all the noise around it, the so-called "antennagate" didn't prove to be much of an issue for consumers. Apple eventually removed its website created in response to the controversy, and ended its free case program. The iPhone 4 went on to become Apple's best selling smartphone in the company's history, achieving a record 20.34 million sales last quarter alone. With "antennagate" now well behind it, Apple has introduced a tweaked antenna on its iPhone 4S handset —a modified, multifunctional design that promises better reception and even faster data transfer speeds. In its promotional materials, Apple has stated that the iPhone 4S is "the first phone to intelligently switch between two antennas to transmit and receive, so call quality is better." However, the company has not gone into great detail to explain exactly how the dual-antenna system works. In his review of the iPhone 4S, Jim Dalrymple of The Loop noted that the dual-antenna design is exclusive to Apple, and in his experience it boosted signal not only on calls, but also general reception. "To be perfectly clear —this is an Apple-only technology," he wrote. "While other companies can receive on dual antennas, no other company can transmit and receive on dual GSM and CDMA antennas." Scpencer Webb, CEO of antenna design firm AntennaSys, told Gizmodo that he thinks that Apple may have come up with a unique algorithm for distributing antenna signals for the iPhone 4S. With this, Apple could implement a selective processing method where the handset would choose the better signal offered by the phone's two antennas, all while meeting radio-frequency emission requirements from the Federal Communications Commission. While Apple has promised the new antenna will improve reception and call quality, it won't be a fix-all for network woes. For example, Walt Mossberg of The Wall Street Journal found in his testing on AT&T's network that he still experienced a number of dropped calls. However, a colleague testing identical iPhone 4S hardware on Verizon's network experienced no such problems. But Edward Baig of USA Today said he din't experience any dropped calls in his testing of the iPhone 4S on AT&T's network. He described call quality with the iPhone 4S as "generally quite good." Improvements to the iPhone 4S antenna don't stop with its proprietary dual-antenna technology. Changes to the design of the phone have also made it HSDPA compatible. That means that maximum download speeds on an HSDPA GSM network are up to 14.4Mbps. That's double the maximum speed of 7.2Mbps possible with the iPhone 4. HSDPA speeds can, under the right circumstances, be comparable to some true 4G LTE networks. 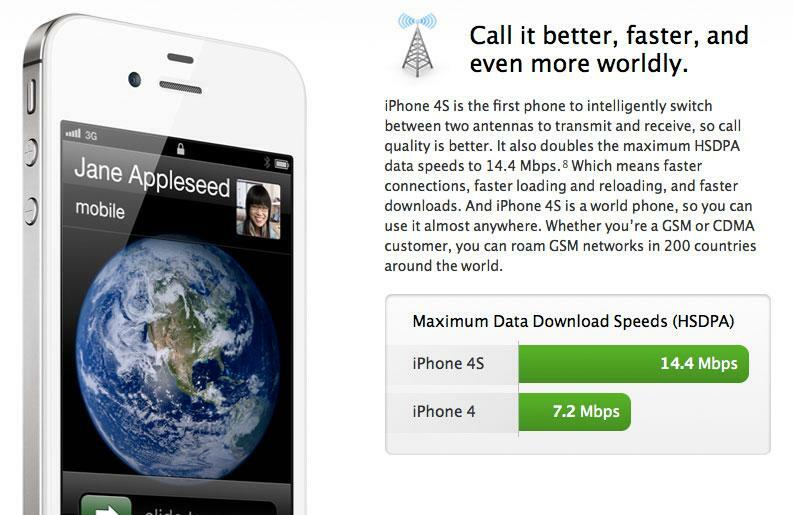 In his testing of the iPhone 4S, Mossberg said he experienced 4G speeds in areas where AT&T has deployed its HSDPA network. "In numerous tests at three different locations in the Washington suburbs, I averaged download speeds of nearly 7 megabits per second —better than in prior tests on Sprint and T-Mobile 4G phones," he wrote. While 4G-like speeds may be possible in some areas with GSM carriers like AT&T, the upgrade does not apply for customers of CDMA carriers, like Verizon and Sprint in the U.S. Verizon customers who upgrade from an iPhone 4S, for example, will achieve the same speeds as with the iPhone 4. Because of this, AT&T is believed to be pushing Apple to add a "4G" indicator to the iPhone 4S status bar. However, AT&T's HSDPA network is not "true" 4G long-term evolution, or LTE. 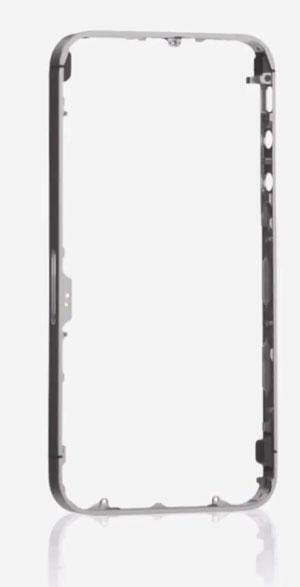 Beyond additional speed for some, the new iPhone 4S design and accompanying antenna will allow for more flexibility. The iPhone 4S is a "world phone," which means that both GSM and CDMA customers will be able to roam worldwide on GSM networks. Previously, if a customer bought the CDMA-only iPhone 4, released on Verizon's network earlier this year, they could not roam outside of the country, such as in Europe where CDMA networks are not common. The inclusion of both GSM and CDMA radios in the iPhone 4S will allow those customers to use their handset worldwide more easily.